Third-generation shearer Col Ferguson and huntaway dog Basil in the shearing shed at North Bundy in the Riverina. Photography by: Chantel McAlister. IN almost every aspect of farming, technology has lifted the load. From stacking pallets to spraying fields, there’s a piece of equipment to make it faster and as easy as pressing a button. There’s just one notable exception: shearing. Despite innovations from injectables to upright posture shearing platforms to reduce the backache, Merino woolgrower Peter McCrabb says he can’t see the main techniques changing any time soon. Peter runs North Bundy at Booroorban, south of Hay in the NSW Riverina. The problem is woolgrowers constantly find themselves with a geographical and seasonal shortage of good shearers – and that’s the last thing they need with the current China-fuelled wool boom. But why is there a shortage? 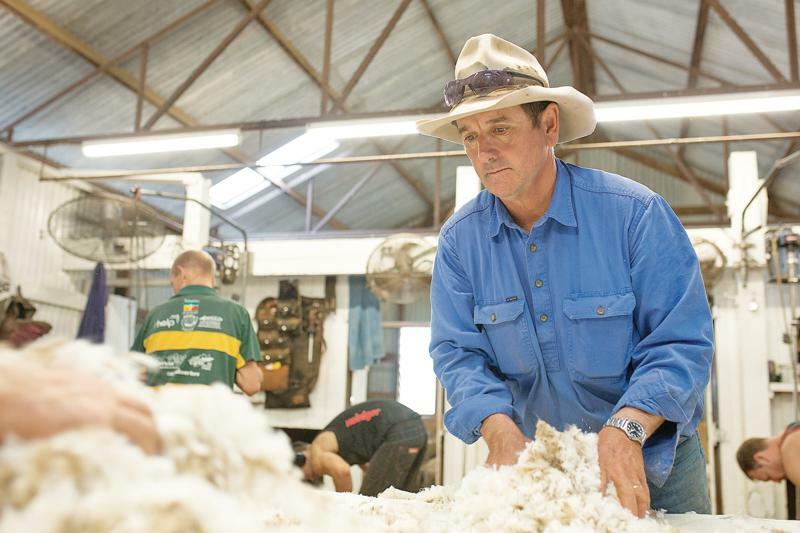 Shearing courses are regularly oversubscribed, says Australian Wool Innovation (AWI) shearing industry development coordinator Jim Murray – and that’s not surprising. The best modern shearers are great role models – fit, articulate and earning six-figure sums. Women are joining the ranks and what some may lack in strength, they make up for with good hands and feel for the sheep. 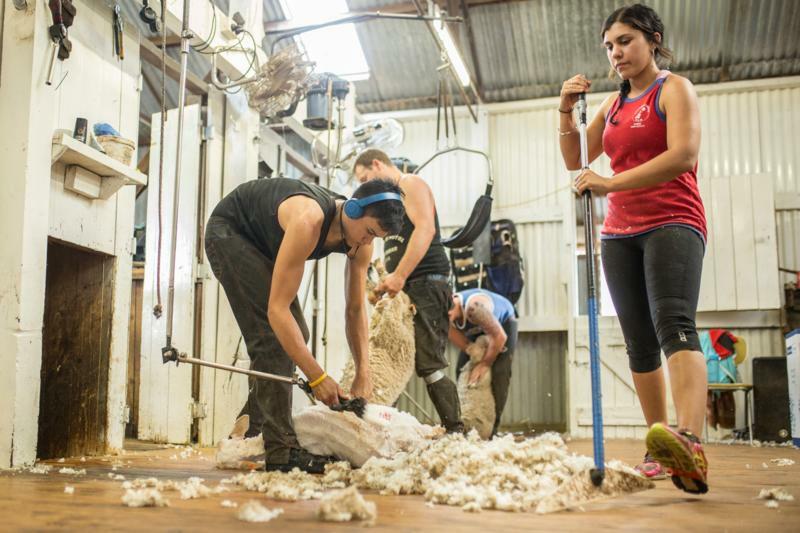 Contractors get to travel, work in a team and there’s a good variety of jobs in a woolshed. Two young guns, Carlos Judilla and Krystal Weatherall, hard at work in the shed. However, says Jim, the problem is many young shearers aren’t staying in the job. There are 2,874 resident shearers in Australia (including about 200 women), down from 3,200 in 2012. “We’re putting 200 people into the industry full-time each year, so in 20 years we should have increased the workforce by 25%. What we need to look at is why young people, and even those more established, are looking to leave the industry,” Jim says. The first reason is that drought means sheep numbers are lower than usual. “Some of those kids might only get three or four days a month of work and that’s not sustainable,” he says. In addition, there is a reluctance to put learners on the boards. Before the Pastoral Award was modernised in 1998, Jim says the award stated every fifth stand had to be filled by a learner. Peter McCrabb, a member of NSW Farmers’ Wool Committee, agrees and says he has always been willing to have learners in his sheds. “You have to encourage them. Some might do a few less sheep and not be so polished but we need them to keep the industry going,” he says. Peter McCrabb rolling the wool. Third-generation shearer Col Ferguson, the contractor Peter has been using for the past 10 years, brings a complete team with him. “My family has always had learners, so I’ve tried to carry that on and it’s worked for me,” Col says. Dave Ferguson, Carlos Judilla and James Ferguson shear the sheep at Peter McCrabb’s property. Perhaps a more surprising issue turning young people away from shearing, says Jim Murray, is lack of internet access on properties. “You are severing their communications with their peers and the rest of the world,” he says. “We want young people to physically push themselves to their absolute limit and, at night, if they don’t have that connection to families and partners, it makes it very difficult. Col Ferguson’s team travels more than 1,000km every six months to shear Peter’s 6,500 to 8,500 Merinos. Peter says he employs them because they’re the best he’s seen in 50 years of wool growing and he looks after them accordingly. The shearing team working at North Bundy, from left: Dave Ferguson holding kelpie pup Jess, Col Ferguson, Ian Sandilands, Paul Crumblin, Helen Ekins, Krystal Weatherall, Carlos Judilla, James Ferguson and James Tubman. He is constantly updating his shearing quarters including air-conditioning, power, new toilets, mobile phone boosters, decent pressure showers and electric lights. He also provides the shearing team with a tank of fuel for their cars. In the sheds, diesel overhead gear has been replaced by safer electric stands and the petrol motor wool press has been replaced by a quieter electric model. Krystal Weatherall, 24, has been working for the Ferguson contracting team for four years and recently qualified for her wool classer’s stencil. My family has always done contracting work and I loved going with them in the school holidays. I enjoy travelling around, meeting new people and having new experiences. When Col Ferguson was down a few rouseabouts and asked me to fill in, I agreed and a week later he offered me a full-time job. I’ve done all sorts of jobs in the woolshed since but about two years ago, I wanted to find the next step up so I started a wool-classer course. Col’s taught me a lot and I’d love to be his classer and go up in the industry from there. I’ve already been invited to Melbourne by a wool broker to evaluate the wool stores there. That’ll be more knowledge I accumulate and it’s a nice gesture that someone has noticed how keen I am. Classer Krystal Weatherall handles the wool. Basically you find out how to improve and who the best trainers are through word of mouth – either talking to people or through social media. I’m on a Shearing Worldwide Facebook group, which is great. People put up blogs about their businesses and you can get in there and call them. That’s how I found my classing course. I feel my skill level from when I started has gone through the roof. I’m always picking up tips. I’m happy to keep pushing myself so I become the best I can be. I’m usually the only woman on Col’s team but that’s fine. They look after me and I feel like I’m part of the family. The industry generally has improved though – especially with safety and equipment, and I can earn a good living as a wool classer. Every contractor has their own rates but it’s $300 a day upwards. The best woolgrowers put in a bit of effort to attract the best shearers and we appreciate that. They look after us and we look after them. James ‘Boogie’ Ferguson, 27, is Col Ferguson’s son and has been a shearer for 10 years. He’s also a trainer. At 20, he was the youngest person ever to be picked for the Queensland state shearing team. James Ferguson shearing a lamb. Initially I was going to be a boilermaker. I did a three-year apprenticeship and then Dad asked: ‘Do you want to shear just one sheep so you can say you’ve done it?’. Afterwards, I said: ‘I’m never going back welding’. I fell in love with it straight away. I went to shearers’ schools in Australia and New Zealand. It’s important to go to school because there are new skills developing all the time. It’s not just work hard and shear the sheep, it’s all about timing, position, pattern, footwork, turning… You never stop learning and improving your style. There’s always something new. I always tell other young people to research who the best shearers are and develop their skills around them. That’s why I went to New Zealand to work. They’re the best in the world. If you learn the proper way, you can keep pushing yourself from there. When I first started the shearers all used to drink after work. Now they’re all into fitness. It’s not unusual to see a bloke do eight hours shearing then go to the gym for two hours. They drink protein shakes instead of Coke. There’s more focus on diet and nutrition and we do a lot of cardio to stay lean. There are five fellas on a stand and they’re all shearing different numbers so it’s like a competition every day. The most I’ve done is 405. The world record is more than 800. Mostly I shear around 200 sheep a day and the money is pretty good. I grossed $150,000 last year and you can boost your income with competitions. In the past year I’ve won $12,000 in prize money, plus entering competitions gives you a benchmark of where you’re at and where you can be. Peter McCrabb, Boogie Ferguson and James Tubman in the catching pens. Good farmers look after their shearers. In saying that though, you don’t start earning top dollar, it starts hard. For the first 10 months your body aches and nothing works for you. It tests you as to whether you’ll stick at it. You also need good mental strength. You’re on the stand on your own, doing something repetitive and if the sheep are fighting you it can play with your head. You need that mental strength to keep pushing yourself. The biggest change I’ve seen in shearing is the travel. When I first started we’d be at sheds for three weeks. Now, with the drought, we’re probably going only a week. I’ve always loved the travel and meeting new people but it is harder now I have children. You need an understanding family. You also need farmers who look after their shearers. They’re earning good money – up to $3,500 a bale, and then we get there and find the shearers’ quarters have no roofs, no flushing toilets. If we politely ask if they can make improvements, some say: ‘Oh you’re only here for a week’. What they don’t realise is that we might only be there for a week but we’re at the next shearers’ quarters for another week and we don’t want to be in those conditions all year. I can’t see myself ever leaving the shearing industry – I mean I’m fourth generation. I just love it.